Before the advent of anaesthesia, medical surgery was a terrifying prospect. Its victims could suffer indescribable agony. The utopian prospect of surgery without pain was a nameless fantasy – a notion as fanciful as the abolitionist project of life without suffering still seems today. The introduction of diethyl etherCH3CH2OCH2CH3 (1846) and chloroform CHCl3 (1847) as general anaesthetics in surgery and delivery rooms from the mid-19th century offered patients hope of merciful relief. Surgeons were grateful as well: within a few decades, controllable anaesthesia would at last give them the chance to perform long, delicate operations. So it might be supposed that the adoption of painless surgery would have been uniformly welcomed too by theologians, moral philosophers and medical scientists alike. Yet this was not always the case. Advocates of the “healing power of pain” put up fierce if disorganised resistance. The debate over whether to use anaesthetics in surgery, dentistry and obstetrics might now seem of merely historical interest. Yet it is worth briefly recalling some of the arguments used against the introduction of pain-free surgery raised by a minority of 19th century churchmen, laity and traditionally-minded physicians. For their objections parallel the arguments put forward in the early 21st century against technologies for the alleviation or abolition of “emotional” pain – whether directed against the use of crude “psychic anaesthetisers” like today’s SSRIs, or more paradoxically against the use of tomorrow‘s mood-elevating feeling-intensifiers i.e. so-called “empathogen-entactogens”, hypothetical safe and long-acting analogues of MDMA. It’s worth recalling too that early critics of surgical and obstetric anaesthesia weren’t (all) callous reactionaries or doctrinaire religious fundamentalists. Nor are all contemporary critics of the use of pharmacotherapy to treat psychological distress. The doubters, critics and advocates of caution were right to consider the potential diagnostic role of pain – and to emphasise that the risks, mechanisms and adverse side-effects of the new anaesthetic procedures were poorly understood. In Victorian Britain, around 1 in 2500 people given chloroform anaesthesia died directly in consequence. Around 1 in 15,000 died as a direct result of being administered ether. This statistic pales beside the proportion that died from post-surgical infection; but it compares with the present-day mortality figure of 1 in around 250,000 people who die as a direct result of undergoing surgical anaesthesia in the UK. Safe and sustainable total anaesthesia that is 100% reliable – and reliably reversible – is as hard to achieve as safe and sustainable analgesia, euthymia, or euphoria. Yet the technical and ideological challenges ahead in banishing suffering from the world shouldn’t detract from the moral case for its abolition. I just don’t get how anyone can defend the wisdom of repugnance when history shows us that those things we find repugnant today will often seem unobjectionable tomorrow. I get very angry when queasiness backed by the force of the state forces people into lives of unnecessary suffering and/or kills them. 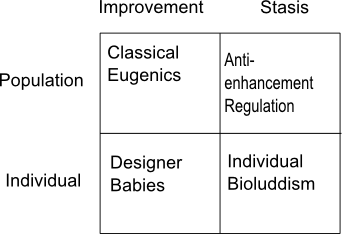 Only the status quo bias allows us to see a moral difference between forcibly denying a child cognitive enhancement drugs and forcibly inducing brain damage to make him less intelligent, or between killing a person and forcibly preventing them from acquiring life-saving medicine. As a rule, if you feel queasy about something but can’t rationally justify that queasiness, there is no wisdom in your repugnance. Unfortunately, people seem quite capable of using horribly bad arguments to convince themselves that their gut reactions are rational. So much for eternal youth! Most respondents to our latest global survey are just fine with their limited shelf life here on earth. Not even the younger crowd consistently chooses immortality. In fact, more than 50 percent of those 45 and under in seven countries (including the United States) report that they don’t want to live forever. Brazilian youth buck the trend, with 74 percent preferring no expiration date. Two surprises: In the Philippines, everyone over 45 wants life everlasting; in China, not a single older survey-taker does. 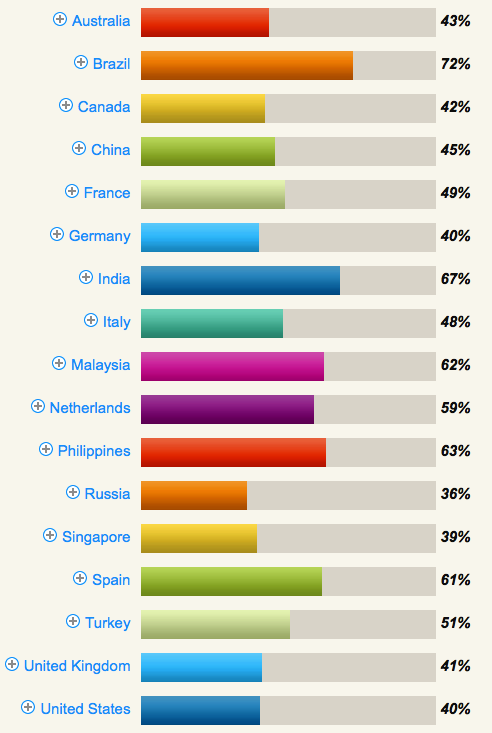 Mike provides this graph of the percentage answering ‘yes’ by country. A cursory glance suggests a negative relationship between GDP and stated desire to live forever. That could well be sampling bias, as the readers of Reader’s Digest in rich and poor countries are probably very different people. I’m pretty convinced that if life-extension technologies were available, many more than this poll suggests would use them. Firstly, the decision of whether or not to live forever is never a decision anyone will actually have to make. Even if we can indefinitely expand lifespan, it will be possible to refuse them or commit suicide if life ever becomes a drag. I’m not quite sure whether I want to live forever, but I’m pretty sure I want to live longer than one hundred years, and suspect I’d be keen to keep living at least a few hundred. It’s pretty difficult to imagine far beyond that. Secondly, expressive concerns about how we’d like to see ourselves and have others see us are bound to dominate in surveys. Living forever is generally seen as a weird and geeky idea, and not something that most respectable people want to be associated with. People see the acceptance of death as a sign of bravery and maturity, and that is exactly what it is when we can’t avoid death. Most people, for lack of imagination, continue to see a normal lifespan as the best they can hope for. Finally, a good deal of it is just plain sour grapes. People, I would say incorrectly if they’re younger than 50 or so, assume that they cannot have immortality, so they engage in a heroic effort of rationalization to make themselves feel better about things. They wanted to die anyway. All new technologies which promise to make our lives radically better are greeted with suspicion. I just hope nobody I care about dies as a result of this suspicion. Health education should provide useful, factual information to enhance rational decision-making, that is, reasoned choice. One of the possible outcomes of such a decision is to ignore the health warning and to accept the risk. Health promotionists would see such an outcome as the failure of their efforts and would describe such a choice as ‘irrational’. The resulting frustration of health educationists leads to the advocacy of more ‘efficient’ methods, that is various forms of coercion by means of legislation, moral pressure and the use of sophisticated, manipulative techniques developed by the advertising industry. Petr Skrabanek. The Death of Humane Medicine and the Rise of Coercive Healthism, p. 142. Devil’s Kitchen makes essentially the same point more directly in the final paragraph of this post.